Can "reality" ultimately be defined? "Curiously, reality can be relative -- perceptually as well as experientially. For those individuals who claim to have had an out-of-body experience or 'close encounters' of any kind, that is their truth. While for those who have not had these types of experiences, they can seem fantastic and impossible. Oddly enough, both groups may be correct in their beliefs. For who can say who's right and who's wrong in either instance?" Consciousness researcher, author, and contemporary cyber-shaman Zoe Seven returns in Back from the Void -- engaged in new experiments, which lead him once again into uncharted territories of the psyche. This time, he combines the shamanic Amazonian brew ayahuasca and the psychoactive "diviner's sage" Salvia divinorum together with hemispheric synchronization of the brain via "mind machines". This alchemical fusion brings about a never-before-experienced altered state of consciousness he calls the "Zenith7" state. While engaged in it, Seven discovers that he has been unwittingly "guided" by these ancient plant entities to combine them -- something never before attempted -- as these plants needed to psycho-energetically "mate" inside the mind of a human. Find out for what purpose, and learn how Nature is in the process of helping create a crytical mass within the human species via symbiosis with plants, as humanity begins to acknowledge the mass hypnotic hallucination called "waking reality" and readies itself for the coming evolutionary leap of consciousness into a new real of existence. 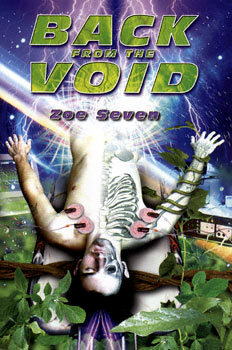 Back From The Void depicts the mind and experiments of a new explorer of the psyche, Zoe Seven. In a style reminiscent of pioneering scientist Dr. John C. Lilly's autobiography Center of the Cyclone, or Ken Russell's film Altered States, Back From the Void is a must read for professional and amateur psychonauts alike.